StoryCitra-Do you like to drink milk? Honestly, I can not drink milk while I was teenager. While mommy gives me white milk drink, silently, I throw it in the trash or ditch. O.K do not follow my trick pretended I am drinking the milk. It is not good, O.K. Today, Citra wants to tell you story about drinking soyfresh Hershey’s cold. I love this soyfresh because the taste is not so sweet like the other soyfresh I ever drink. Many people know as you and I, soymilk is tricky. Am I right? Because the main concern is flavor bean and it just taste of bean and aroma also like bean. Soyfresh Hershey this is so different because this soy milk is made from soy bean even it is not original from bean but the taste is not so bad. Really! 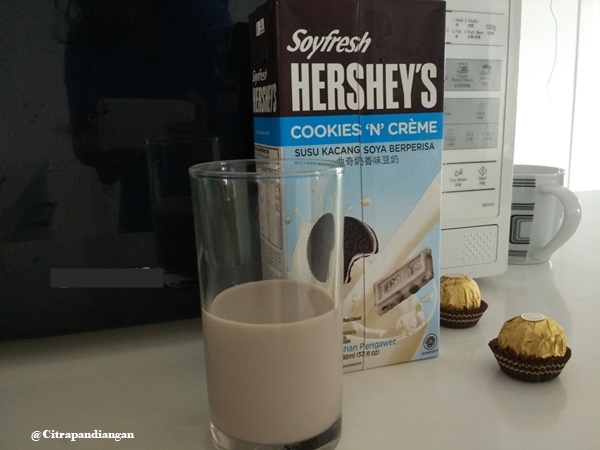 I love to drink this Soyfresh Hershey's cookies and cream in morning time. 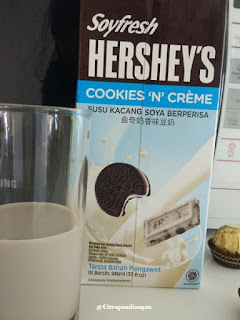 That is why I can say this Soyfresh Hershey's cookies and cream flavor is so great, because I still can taste the bean flavor even this soya already blend with the cookis and cream. The most I love this variant taste of soyfresh Hershey's cookies and cream because it is not too sweet. Lately, even I love to eat chocolate but when drink too much sugar. I feel like what the hell this drink, why the taste so damn sweet and I can not drink it a lot hahah. This Soyfresh Hershey's so different. That is why I love to drink this soya. 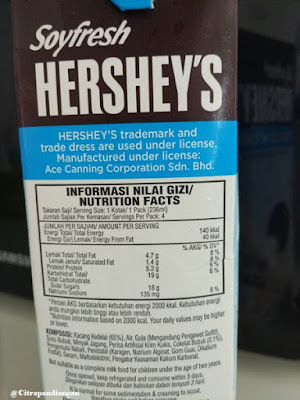 Ingredients: Soya Bean Extract (65%), Water, Cane Sugar, Milk Powder, Corn oil, Cookies 'n' Creme flavour, Hersey's Cocoa Powder (0.1%), Emulsifier: Mono & Diglycerides of Fatty Acid E471, Stabilizer: Carageenan E407, Sodium Alginate E401, Guar gum E421; Salt, Maltodextrin, Acidity Regulator, Potassium Phosphate E340, Potassium Carbonate E501. Contains Milk and Soy Bean. (one of box Soyfresh Hershey's). 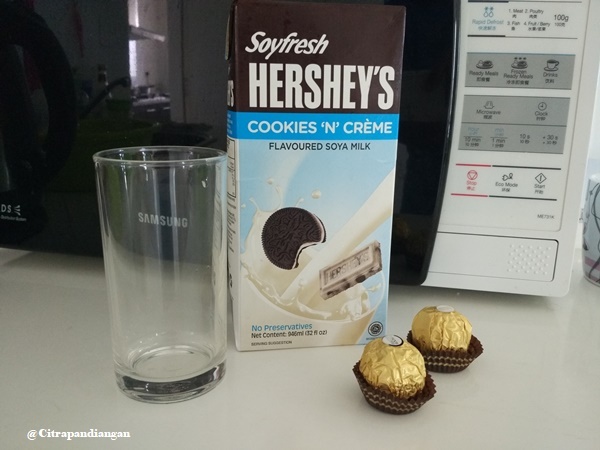 How to Prepare or cook: Before drinking one of glass Soyfresh Hershey's cookies and cream. I put the box of soyfresh in the I put it in the most frozen or cold refrigerator for five to ten minutes. Then I put it in glass without add ice to get this Soyfresh Hershey's cookies and cream cold. 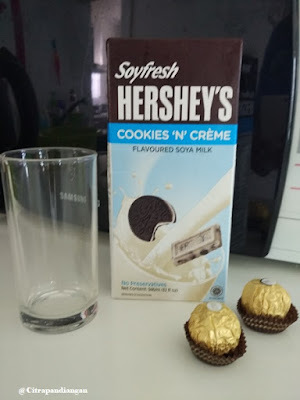 The reason why I like to drink Soyfresh Hershey's cookies and cream because this is not too sweet and the milk is not to make me feel want to throw out after inside of my belly. So, the most I love drinking soyfresh while it so fresh and cold after out from the cold box. It so great to start a day in the morning time. What do you think my friends? What is making you feel so happy to start a day? while and yours is the greatest I've found out so far.